By utilizing gravel in your garden design, you can improve drainage and make the most of your gardening space. When it comes to your garden, you know that placement and design is not just about aesthetics, but also drainage and plant health. But when it comes to designing your garden, you may not have considered using gravel. By utilizing gravel in your garden design, you can improve drainage and make the most of your gardening space. Here are just a few tips for enhancing your Aberdeen garden with gravel this year. If you want to make the most of your garden space, gravel is the way to go. 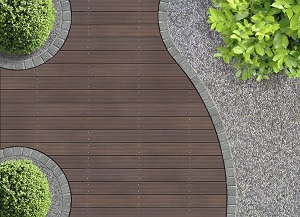 By creating soft, curving paths, you can make unique design elements out of your garden beds. Soften the edges to create flow and maximize space. Try using a garden hose to map out your garden design before laying gravel. Gravel is a great way to increase drainage in your garden, especially if you don’t get a lot of rainfall. Using a few inches of gravel as mulch, you can trap moisture at the base of your plants to keep them healthy all season. Plus, using gravel will help to suppress weeds, keeping your garden more beautiful and requiring less maintenance. A key part of designing with gravel is being mindful of texture. Gravel adds a lot of texture to the visuals of your garden, so you’ll want to provide plenty of contrast through plants. Mix it up with softer plants and grasses paired alongside tall, spiky plants and colorful flowers. This will be sure to create plenty of visual interest across your garden design. Gravel can go a long way in your gardening design, especially when it comes to making your colorful plants and flowers stand out. Bright pink, purple, and yellow bloom stand brightly against grasses and foliage when lined with gravel. This is especially true of plants that are able to make the most of rainfall thanks to mulching with gravel! Trust Lehnhoff’s Supply and Design for All Your Gravel Needs! Lehnhoff’s Landscaping is delighted to introduce Lehnhoff’s Supply and Design. We seek to fulfill all of your landscape supply and landscape design needs no matter what project you’re looking to complete. We are based in Fallston, Maryland and are eager to lend you our expertise and materials. Find us at 2708 Belair Road, Fallston, MD 21047. Call us at 410-510-7646 or drop us a line via email at lehnhoffsupply@gmail.com. Lastly, don’t hesitate to reach out to us on Facebook, and Twitter! We serve but aren’t limited to, the following parts of Maryland: Harford County – Fallston, Forest Hill, Joppa, Edgewood, Bel Air, Churchville, Havre de Grace, Jarrettsville, Street, Aberdeen, Abingdon, and Joppatowne. This entry was posted on Friday, March 29th, 2019 at 12:00 pm. Both comments and pings are currently closed.